The VS-66HN is a high-performance matrix switcher for HDMI signals. It reclocks and equalizes the signal and can route any input to any or all outputs simultaneously. 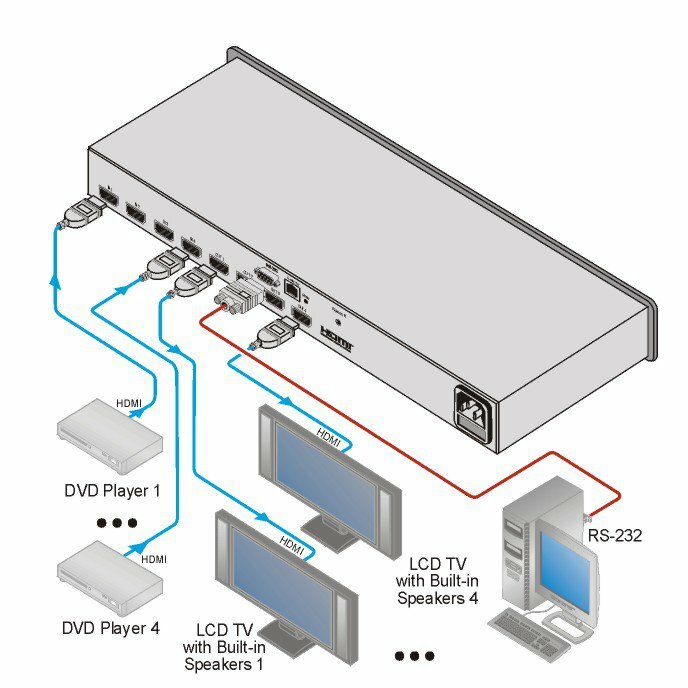 HDMI Support - HDMI support for Deep Color, x.v.Color, Dolby TrueHD, Dolby Digital Plus, DTS-HD, and linear PCM 7.1 surround sound. Flexible Control Options - Front panel, IR remote, RS-232 (K-Router Plus Windows-based software is included), Ethernet (Windows-based Ethernet Configuration Manager & Virtual Serial Port Manager is included). Diagram above reflects the 4x4 model.